Engineers are always working hard to make structures even lighter and stronger. That is why FEA-Opt Technology Co. Ltd. develops SmartDO, and will soon add a module to interact with NX CAE Laminate Composite for automatic design optimization of composite structure. Composite material has been applied on many different products due to its superior stiffness and strength to weight ratio as well as easy to adapt on complicated shape, in addition to other advantages. Common application includes defense, aerospace, automobile, consumer electronics and sport utilities. With the same strength, structure built with laminate composite material is usually much lighter than sheet metal. Figure 1 shows the common application of the laminate composite structure. The traditional design process and methodologies are not completely suitable for the design of laminate composite structure. Due to the inherent limitation of manufacturing and work share among supply chain, the design of composite structure is usually divided into three stages, as illustrated in Figure 2. Design of Shape : this is usually decided by industrial design (ID), or special requirement like aerodynamics performance. If the shape can be freely altered, usually the material can be first assumed as isotropic material such as sheet metal, and general shaping optimization methodologies can be employed. SmartDO also provides SmartLink for NX CAE and SmartLink for ANSYS Workbench for parametric optimization. Layup/Ply group breakdown : the division and breakdown of layup/ply groups are often restricted by manufacturing condition. For complicated shape or geometries like intersection of manifold, the zone needs to be isolated and added stiffening patches. Sometimes the group division will be decided by existing experience and database. If none of the above applies, it is useful to perform a stress analysis with isotropic material and uniform thickness. Such information provides useful guideline for layup group division. Number of layers, selesctions of material and fiber angles : currently the general process is to consider the structural as isotropic material like sheet metal, and the thickness can be decided. Number of layers and orientations of fibers can then be designed by referring to the stress direction and the equivalent strength of the metal thickness. Selection of materials are usually based on experience or try-and-error. This approach is based on local response for equivalent design. This does not account for its influence on the global structure and needs further verification on the global layup. Due to its discrete nature in mathematics, this process is difficult to be systematized and automated. Process based on this methodologies needs constant user interference and requires strong design experience. Concurrent design of the global layup is difficult to achieve, if not impossible. FEA-Opt Technology Co. Ltd. will release the SmartLink for NX CAE Laminate Composite module for SmartDO 8.0. This module is built on the SmartDO RGA optimizer technology, and is integrated/interacting with NX CAE Laminate Composite. The user first creates composite structure CAE model in NX CAE Laminate Composite. Then the model is imported into SmartDO, and the user further defines the following design data to perform automatic design optimization. Maximum allowable number of layers in each group. Options for materials for each group of plies (choosing from NX CAE model). Design Objectives (for example, weight or cost) and design constraints (for example, deformations, stress). Maximum number of calculation allowed (for NX CAE). The user then hit the "Full Optimization" button in SmartDO to perform fully automatic design optimization. During the design iteration, SmartDO will constantly call NX CAE to verify the global response according to the design criteria defined by the user. 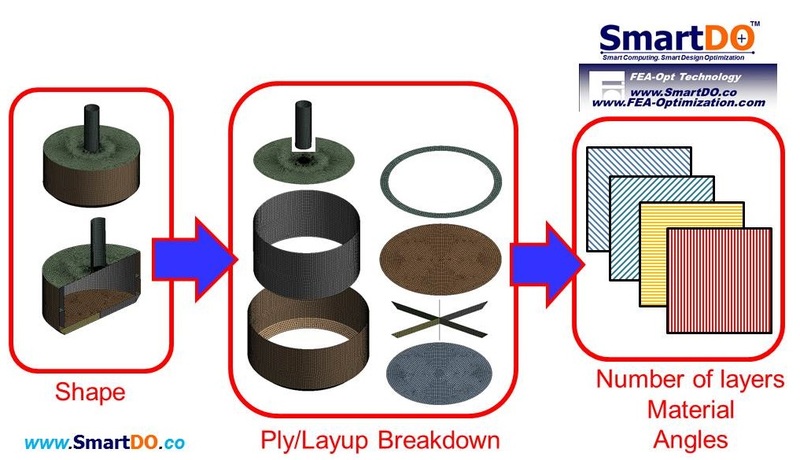 After the design iteration, if the optimization is successful, SmartDO will provide a design including number of layers in each group, materials and angle orientations used in each ply, as indicated in Figure 3. For more details about the operation and user interface of SmartDO, see the following movies in YouTube. The movies show how to use SmartDO and NX CAE Laminate Composite to perform design optimization on a simple structure. Although the configuration of the structure is simple, the concept and procedure is applicable to the optimization of any other composite structure.